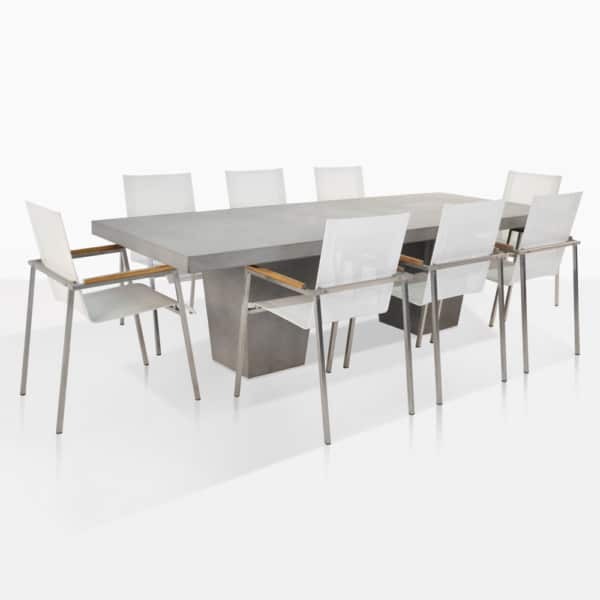 Sharp, modern, and sophisticated perfectly describes this Concrete, Steel, and Batyline Mesh Dining Set. It features 8 Summer Stacking Dining Chairs in white and our 98”x 39” Raw Concrete Tapered Outdoor Dining Table. The concrete is bold and heavy, and the mesh dining chairs in white add the perfect amount of a light and airy vibe. Purchase this set, or choose your own set! We have so many chairs and tables to choose from. Be inspired to dine outdoors in style! Teak Warehouse uses 316 Marine Grade Stainless Steel as a standard. It’s a significant improvement over the usual industry standard (304 Stainless Steel) for outdoor furniture. We use this premium stainless steel for several reasons: it’s better looking, more suitable for harsh outdoor environments and it is easier to maintain. When you purchase a piece of stainless steel outdoor furniture from Teak Warehouse you can be sure you’re getting premium Stainless Steel products. Caring for your Stainless Steel Furniture from Teak Warehouse is easy. Because we use 316 Marine Grade Stainless Steel, your maintenance requirements are minimal. This means you can enjoy your furniture and know it’s looking amazing. Our standard use of 316 Marine Grade Stainless Steel is indicative of how important we see premium materials in the construction and design of outdoor furniture. Click to find specific information about caring for your Stainless Steel Outdoor Furniture from Teak Warehouse.